I’ve been doing my regular MOD battles for slicing. I’ve gotten a few shards that I need but mostly ones I don’t. No biggie, it’s all bonus. However, most people are saying they at least get shard store credit, but I don’t seem to get any Shard Store credit for those from the event. Am I the only one that’s happening to? They’re talking about how those characters you don’t need get converted into shard shop currency. Not saying that the event directly gives shard shop currency. No. Because it's your own fault for not reading it clearly and for getting your expectations up. I read I'd have a chance at getting shards of some characters, which is a nice bonus on top of the mod stuff I already get when farming slicing materials. This is Magic Shell on top of ice cream. I read it just fine. Stop. Just stop. I read it as only being those three the first time I read it. Saved up credits and the first time I got someone (like the 7th pull) I re-read it and realized it wasn't exactly worded as clear as it could have been. I immediately stopped farming there and went back to my regular mod farming. Not upset as I figured it was too good to be true in the first place. Day 1 player. I rarely post on here, but I just gotta say this is the best thread I've seen to date. I came looking to see if I was the only one having such horrid drop rates recently (not just this event, but everywhere in the game). Anyways, I can't believe how much you guys are raging over your own inability to read. Very clearly said clone wars characters "including". I understand making the mistake skim reading, but then to continue on with complaining about it AFTER it was proved you misread is hilarious. Thank you for brightening my day. Excellent. Rather than deal with the issue, throw it out the window. Seems more immature to not deal with the issue than to 'whine' a point out. If you read it just fine you wouldn’t have the problem you have. It’s okay to admit you made a mistake—pobody’s nerfect. 1. It was definitely poorly worded. 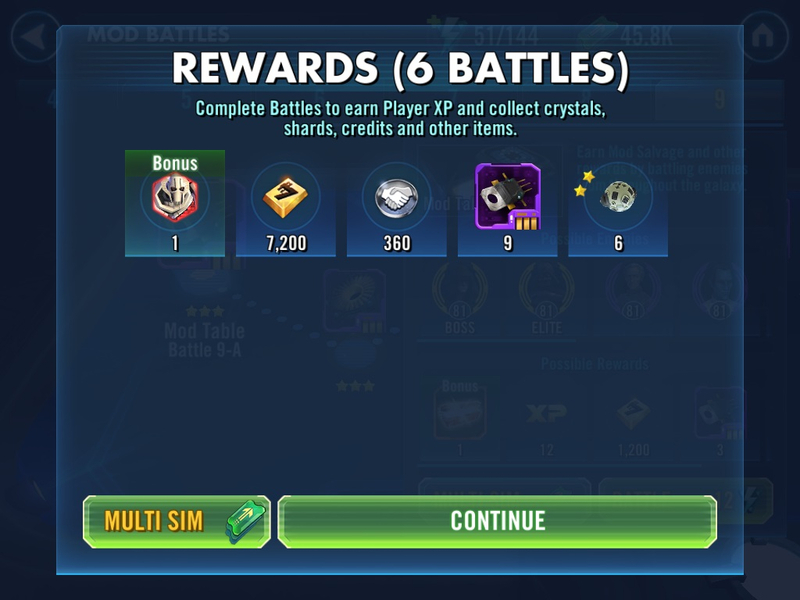 On a first glance i mainly noted those 3 toons and was hoping for jango, but saw random clones and such when i ran 20 runs in the mod battles. 2. It is disappointing for most end game players cause other than jango, the other toons are usually maxed out. Still, shard currency i guess. However, it does benefit newer players and such since it helps with mods and gives random shards of useful toons (e.g. gk, dengar) so i dont see why we should be complaining. It's not a big thing, and even if only jango's shards were being dropped, u arent gonna be getting him to 7* over just 3 days. Got a few shards, Asajj, Clones, and Geos. Best was actually getting that 5 GK. But I already have him at 7*. Couple of times a set of 6 SIMs gave me nothing. The useful shards I got were 1 Fisto and 1 Aayla. LOL!!! As a Marketing major, this is a poor celebration. Marketing is about trying to get you to buy more of what you already have or want. This was getting you excited about possibly getting very little of what you want. If this was limited to 10 Toons, and a better drop rate, it would have made more sense. I'd have accepted getting 30 (Shard Shop fodder) and 2 Jango over 3 days. I think I got a total of 12 shards so far. But I had him at 7* for months now. At least the RNG works. LOL!!! sure you have 2 dev accounts posting woooooo a break is nice but tons of players who like to play game feel like NOTHING TO DO this weekend...nothing..
ON'T COMPLAIN ABOUT FREE STUFF..
What’s that? More marquees you say? Well here you go sir.